He has also worked on many high profile cases in CT including murders, rapes, corrupt priest, the Andrew Kissel murder case and the Chimpanzee attack on a Stamford woman. Colucci Investigations has a staff of six investigators with various criminal justice backgrounds. 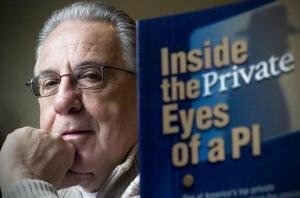 Vito is also co-owner of The Spy’s the Limit Inc.
Vito Colucci is the author of “Inside the Private Eyes of a PI,” in which he talks candidly about divorce in America, missing persons and personal injury cases. You’ll learn professional surveillance tips, tools of the trade, and you’ll even get a look at what goes on in the studio during Vito’s TV appearances. There’s even a funny chapter on Vito’s first meeting with pop super star, Michael Bolton. Vito Colucci is the host of a nationally syndicated radio show, “Crime Time With Vito Colucci” as well as part of the Crime Wire Team and co-host of the internet radio show, “Crime Wire” along with Author, Dennis Griffin and Violence Prevention Expert, Susan Murphy Milano.